Capitalizing on Friday’s breakdown of the ceasefire, Israeli Prime Minister Benjamin Netanyahu has renewed pressure on the US to back Israel’s line in negotiations — if they resume — for a resolution of the 25-day war. Netanyahu told US Ambassador Dan Shapiro on Saturday that the Obama Administration was “not to ever second-guess me again”, according to sources close to the Prime Minister. Netanyahu insisted that Washington trust his judgment on how to deal with Hamas, saying he now “expected” the US and other countries to fully support Israel’s offensive in Gaza. Last weekend, the Prime Minister’s office was so opposed to the ceasefire proposal put forth by US Secretary of State John Kerry that it not only rejected the initiative but leaked the plan to the Israeli media. Officials close to the Government then berated Kerry, through anonymous quotation in the press, for being weak and misguided. In particular, the Israeli Government chided Kerry for stepping away from the Egyptian-led proposal, supported by West Jerusalem, for a halt to fighting with no political conditions. Instead, they said, he had sided with an initiative brokered by Turkey and Qatar which included Hamas’s demands for an end to the Israeli blockade on Gaza and release of Palestinian detainees in Israeli prisons. A further dispute followed on Tuesday when Israeli officials objected to Kerry’s attempt at reconciliation, “Prime Minister Netanyahu has always supported a ceasefire”, framing it as continued US pressure for Israel to accede to the Secretary of State’s proposal. 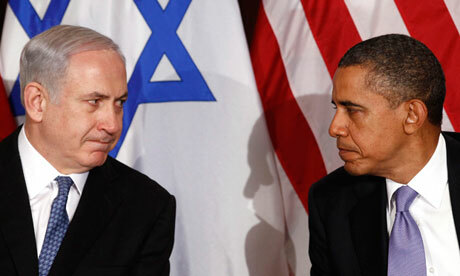 An appeal by President Obama to Netanyahu pointed to the success of Israel’s maneuvers. Netanyahu’s pressure was undermined, however, by the mounting images of civilian deaths and destruction in Gaza, in particular Israel’s shelling of a UN shelter in Jabaliya which killed at least 15 people and wounded more than 90. By Thursday, the White House had edged toward its first blame of the Israeli military in the conflict, criticizing the attack on the former school. However, the quick dissolution of the ceasefire on Friday, as Gazan fighters killed two Israeli soldiers and captured a third — who may or may not have been slain subsequently — saved Netanyahu from further American criticism beyond a general call to avoid civilian casualties. So now the Israeli Prime Minister is back on the offensive, trying to lock the Americans firmly behind him as he opposes any negotiations that recognize Hamas’s position on the blockade, detainees, fishing rights, or other political and economic matters. The settlement will be for “demilitarization” of Gaza and no more than that. Scott Lucas is Professor of International Politics at the University of Birmingham and editor-in-chief of EA WorldView. He is a specialist in US and British foreign policy and international relations, especially the Middle East and Iran. Formerly he worked as a journalist in the US, writing for newspapers including the Guardian and The Independent and was an essayist for The New Statesman before he founded EA WorldView in November 2008. EA on Monocle 24: How Will Israel’s Elections Affect US-Israeli Relations? Yemen’s Forgotten War — Will Britain Ever Care? Syria Daily: What Did Iran’s Foreign Minister Tell Turkey?